Organic granola made for Riverford by our friends at Big Oz. Crunchy granola packed with toasted oats, pumpkin seeds, chia seeds and a mixture of grains. Sweetened just enough with a drizzle of coconut nectar and warmed by a touch of cinnamon. Add a fistful of fresh fruit, and milk or a dollop of yogurt. A brilliant, gluten-free breakfast. 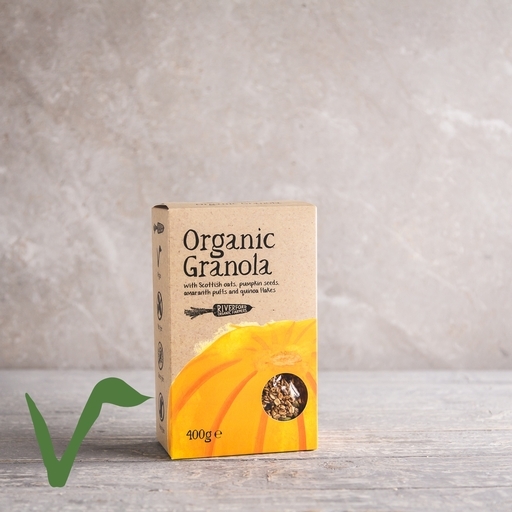 This granola is made specially for Riverford by our friends at Big Oz. They believe in keeping their cereals 100% natural, using pure whole grains. Their organic oats come from the Medlock family farm near Laurencekirk, Aberdeenshire. When ready, the oats are taken just 14 miles down the road to the historic Montgarrie Mill, which dates all the way back to Jacobean times – and has the time-honoured methods to match. The oats are toasted on a flat kiln, turned with a wooden shovel, and left to cool naturally before milling. The whole process takes around 20 days (instead of the few hours it would take in a factory) but is worth it for the flavour.